Outlaw Soaps: The skilled manufacture of highly addictive sundries — Tagged "entrepreneur"
The story of how our small company came up with what we feel is the best lotion in the West, from five years ago to today. I'm very pleased to report that we signed the lease on our new production facility building! It has been a real journey, and I know the journey isn't anywhere near over, but it feels like a big step and a lot of worry is beginning to clear like clouds over our heads. Christmas is our biggest season, and unfortunately this drama started in the middle of us ramping up our production for Christmas. Because this struck such a nerve, I didn't want to leave you hanging about the outcome of this situation. I was at the City Council meeting last week, and I will likely attend all future City Council meetings until the end of the line. The fact is that we're still kind of hanging in terms of the outcome of the situation. I have no real news or updates. I'm hoping no gnus is good gnus in this case. Made in the USA: What it's like to have a small business in rural America. 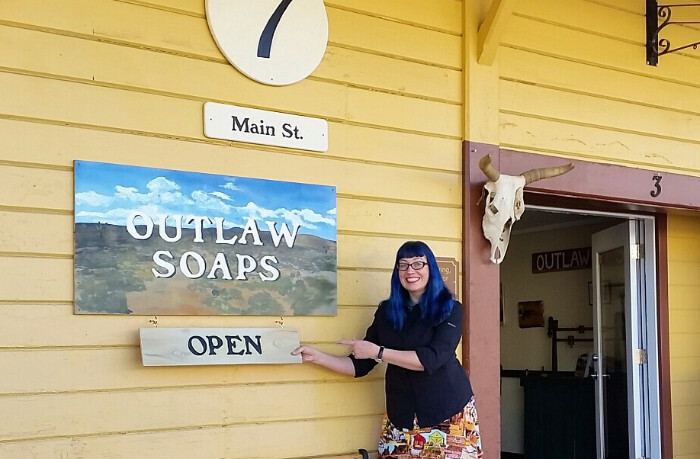 Outlaw Soaps is based in Colfax, California. "People will be all up in your business." "People in town won't accept you." "Aren't you more of a desk type?" "I hope you're not planning on having a retail business. There just isn't enough business here." "California regulations are going to kill you." "Those people aren't going to buy artisan soap." This past couple weeks have been particularly rough on our little business (and employees), so to honor what we're going through. and also to share a little insight into what small business ownership is like, I wanted to tell you a little about our experience: the challenges, the unlikely friends, and where we are right now. It has been a whirlwind of travel in the past few weeks, finally landing me in Los Angeles for LA Mart, a West Coast gift show. Back in 2013, we started Outlaw Soaps in a warehouse in Los Angeles (where we were living with six of our friends). Russ and I had been looking for a way to move out to the country and maybe have a goat or two, have some gravel under our boots, and drink steaming coffee on our deck in the cool morning air, just like in the stock photos and Instagrams. At the time, our lives resembled the exact opposite of that. Our loft didn't even have a window, let alone windows large enough to be sliding doors. But it was a dream, and we were pretty dang clear about it. Will Smith, Work, and Dedication... and how I woke up at 4AM so I could drive to Gilroy and back before my conference today. This morning was pretty rough. I went to bed obscenely early (8ish) last night so I could wake up at 4 in the morning and drive an hour and a half from San Francisco to Gilroy, where the UNFI Distribution Center is. I'm in San Francisco at an all hands meeting for Mozilla, my contract job. Yep, I totally still have another job, even though we hired people and have a profitable business. The bottom line is that it's worth it for me to work for Mozilla and pay someone else to take care of things like packaging soaps. The first attempt at making Fire in the Hole soap came on a weekend in May. I know this very specifically, because I wasn't camping that weekend, and it was our annual May Trip. We had planned on going camping with friends -- one of those crazy weekends of drinking and shooting and lighting things on fire -- but it was our first year of Outlaw Soaps, and small business ownership being what it is, we couldn't see to drag ourselves away for the day-long drive to meet our friends in an obscure corner of the Mojave. Entering our fourth year of business - Holy Cow. have been pretty tough on my l'il ol' heart.